While the pen and paper pieces may be readily determined as such, I thought I might give some context to the sculptures. The first one,titled "One Quatrain," is made of wash clothes that have been shaped and made rigid with an acrylic medium. The second one is made with chewing gum and the notebook. It is called, “Maquette for a Selection of Poems Intended to Be Read Aloud, and Which Have Titles Consisting Solely of Proper Nouns.” I recently wrote about these pieces elsewhere: "And, since words are stand-ins for ideas as well as objects, I have moved this exercise from two dimensions into sculpture. For “One Quatrain” and “Maquette for a Selection of Poems Intended to Be Read Aloud, and Which Have Titles Consisting Solely of Proper Nouns,” I have taken the idea of words on a page, removed the words and replaced them with shapes that mimic the placement of letters and words. Many of the individual shapes in “One Quatrain” are suggestive, not only of letters but also of objects. 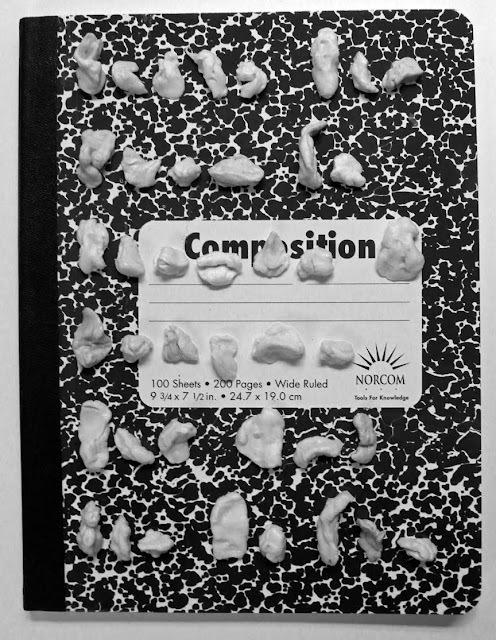 In “Maquette,” the notebook is where poems are written, and the gum is chewed, thereby suggesting the mouth, and when arranged like text, becomes a stand-in for the spoken word."